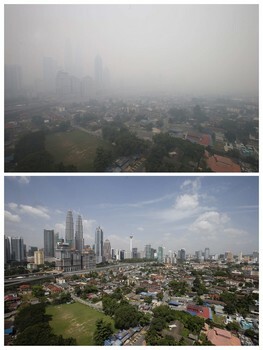 A combination picture shows Malaysia's capital of Kuala Lumpur covered with haze (top) at 1230 p.m. (0430 GMT) on June 23, 2013 with the pollution standards index (PSI) at 111, and five days ago at 1200 pm (0400 GMT) on June 18 with the PSI at 72. Malaysia declared a state of emergency in two parts of the southern state of Johor on Sunday as smoke from land-clearing fires in Indonesia pushed air pollution above the level considered hazardous. A PSI reading above 300 indicates that air pollution is hazardous.